The 3-LED 42mm slim festoon provides the light output from a 5W halogen for a fraction of the power use. This lamp is similar in shape to the tungsten festoon, so is ideal where space is limited. Also available in a 37mm version. The festoon is commonly used in marker lights, interior cabin lights and roof lights and is easily replaced with an LED alternative. There are two common sizes for the festoon, 37mm or 42mm measured end to end. The two versions we recommend are a wide 6-LED version which provides the light output of a 10W halogen whilst only using 1.0W. The other version is a slimline festoon which provides the light of a 5W halogen and is better for marker lights and where space is tight. 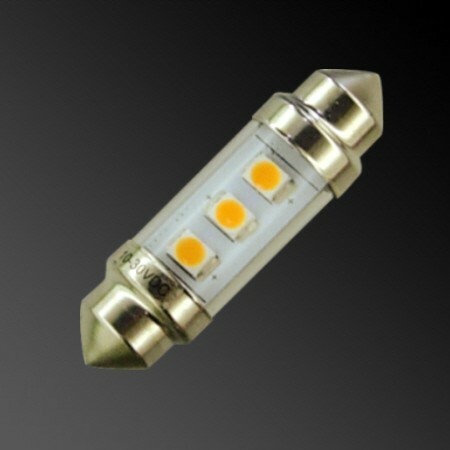 Both types provide a convenient replacement as the festoon used is exactly the same size as the tungsten version, all control circuitry for the LEDs is located on the rear of the circuit so it is just a case of remove the tungsten and replace with our LED alternative.